In order to understand why the sky is blue, first we have to understand why things appear a certain color. Visible light is made up of all colors: red, orange, yellow, green, blue, violet, and everything in between. An object appears blue if it reflects (or more accurately, "scatters", which is reflection in all directions) more blue light than the other colors of light. For solid objects, those other colors are absorbed rather than scattered, and so whatever color is most scattered by the object is the color the object appears. For the atmsophere, though, those other colors pass right through, without being absorbed to the ground. Some of the blue light, though, is scattered off the molecules of air, making the atmosphere appear blue. Why blue? Because the size of the molecules of air are close to the wavelength of blue light...about 0.0004 millimeters in diameter. THE NEXT TIME YOU FLY... 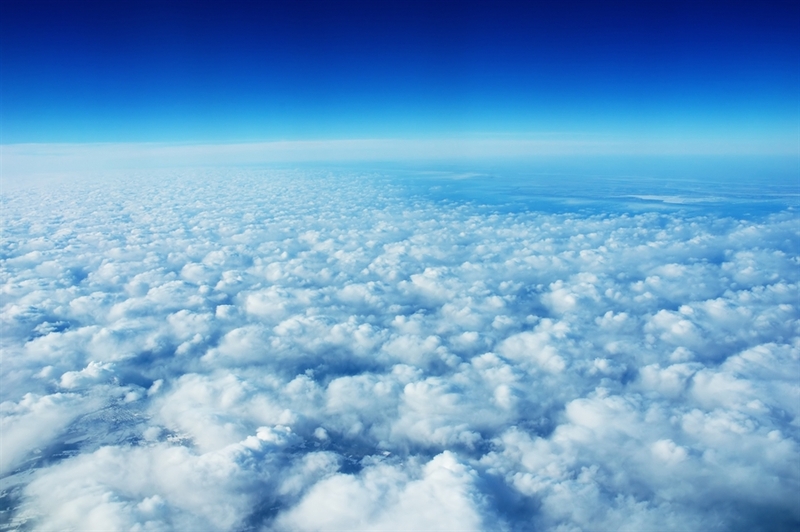 When flying in an airplane at 34,000 ft, you are above 75% of the atmosphere. If you look out the airplane window, and look up, you will notice that the sky is a much darker blue than you are used to seeing. This is because there is less air to scatter the blue portion of the incoming sunlight. An astronaut in space is above the Earth's atmosphere, and so outer space appears black.